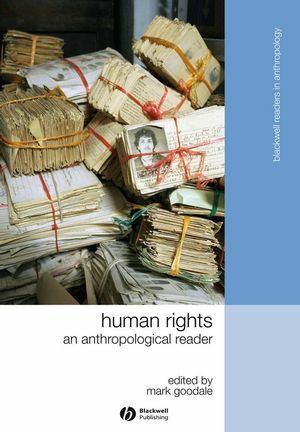 This innovative reader brings together key works that demonstrate the important and unique contributions anthropologists have made to the understanding and practice of human rights over the last 60 years. Mark Goodale is Assistant Professor of Conflict Analysis and Anthropology at George Mason University and the Series Editor of Stanford Studies in Human Rights. He is the author of Surrendering to Utopia: An Anthropology of Human Rights (Stanford UP, 2009) and Dilemmas of Modernity: Bolivian Encounters with Law and Liberalism (Stanford UP, 2008) and coeditor (with Sally Engle Merry) of The Practice of Human Rights: Tracking Law Between the Global and the Local (Cambridge UP, 2007). Introduction—Human Rights and Anthropology: Mark Goodale (George Mason University). 1. Statement on Human Rights (1947) and commentaries: American Anthropological Association, Julian Steward (Late of University of Illinois at Urbana-Champaign), H. G. Barnett (Late of University of Oregon). 2. The Decline of the Nation-State and the End of the Rights of Man: Hannah Arendt. 3. The Good, The Bad, and the Intolerable: Minority Group Rights: Will Kymlicka (Queen’s University, Canada). 4. Toward a Cross-Cultural Approach to Defining International Standards of Human Rights: Abdullahi Ahmed An –Na’im (Emory University). 10. Rotten Trade: Millennial Capitalism, Human Values, and Global Justice in Organs Trafficking: Nancy Scheper-Hughes (University of California, Berkeley). 11. Do Anthropologists Have an Ethical Obligation to Promote Human Rights? : Terence Turner (Cornell University), Laura Graham (University of Iowa), Carolyn Fluehr-Lobban (Rhode Island College), Jane Cowan (University of Sussex, UK). 13. Gendered Intersections: Collective and Individual Rights in Indigenous Women’s Experience: Shannon Speed (University of Texas, Austin). 17. Human Rights as Cultural Practice: An Anthropological Critique: Ann-Belinda Preis (UNESCO, France).